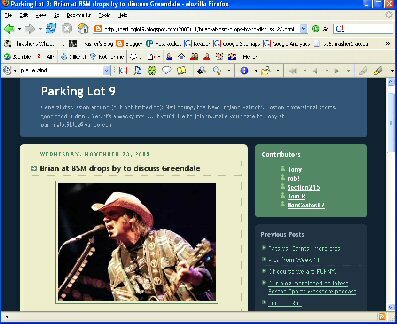 Well, here's a Neil Young blog with a twist - Parking Lot 9. It's labeled as "General discussion around (but not limited to): Neil Young, the New England Patriots, Boston professional sports, good food & drink. Yes, it's a wacky mix." Tony and crew mix it up with their commentary on the football season and pretty much anything else that catches their fancy. Good luck today against the Chiefs. Blog on, dudes! Thanks for the mention Thrasher. Love the "Keep on tailgatin' in the freeworld!" comment!! Now that a little time has passed, it is going to be inarestin' to see the 'HAWKS eat the STEELERS for LUNCH! Neil Young Tickets http://www.ticketwood.com/concerts/Neil-Young-Tickets/index.php . So any body going to the Neil Young concert ? ?